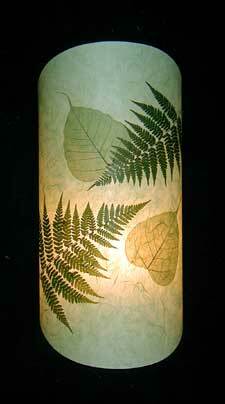 (on left) This wall sconce features forest ferns and green leaves framed by graceful curves on the top and bottom, hugging the wall in a low profile. Measures 16" tall, 7.5" wide, and 4" deep. Custom sizing available. Holds two candelabra bulbs max. 40 watts each. 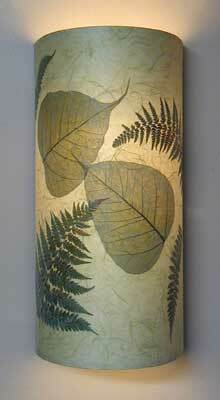 (on right) Delicate lacy green leaves and ferns are arranged by hand on this half-circle wall sconce. 6.5 " wide, 14" tall, 4" deep. Custom sizing available. Holds two candelabra bulbs max. 40 watts each.